Speaker of the House, and Sen. Walter Stosch. The business community is welcoming the results of a mostly cooperative General Assembly session that included steps to improve the state’s workforce pipeline and more money for Virginia’s deal-closing fund. The 2015 session, which ended a day before it was scheduled to, was a 180-degree turn from the partisan vitriol that overshadowed the previous year. Then, bickering dominated the session and resulted in a months-long standoff over Medicaid expansion that threatened a state government shutdown. The impasse ended in early June 2014 with the controversial resignation of Democratic state Sen. Phil Puckett, which gave control of the Senate to the Republicans. Political realities made cooperation a necessity. With both chambers now in GOP control, McAuliffe included Medicaid expansion in his initial state budget, but he didn’t make a public fight when it wasn’t included in the legislature’s budget. The 2015 elections, with all 100 delegate and 40 senate seats on the ballot, provided a strong incentive to get along. “I think the overriding motivation for everything was the fall elections and the possibility that both sides could either lose big or win in some way,” says Quentin Kidd, professor of political science at Christopher Newport University. Kidd says control of the Senate will likely hinge on just three or four seats, making it risky to have a drawn-out session full of partisan bickering. “It was a scenario where both sides had to show to voters they could get done what they were supposed to,” Kidd says. 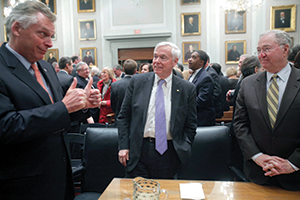 The session certainly wasn’t without its disagreements, including McAuliffe’s veto in May of two bills that would have extended the sunset on coal tax credits from 2017 to 2019, but 2015 marked the first time in 15 years that the legislature ended its session on time. It remains to be seen whether the congeniality will last, with campaign season approaching and the 2016 presidential election on the horizon where Virginia again will be a toss-up state. Transportation funding formula changes (HB1887): Changes how the state allocates its construction funds to put more emphasis on high-priority projects. Starting in 2021, 45 percent of transportation revenue will go toward bridge and pavement fixes, 27.5 percent will be spent on high-priority projects and 27.5 percent will be divided among the state’s nine construction districts. The local portion, instead of going directly to localities, will be used in a construction district grant program to encourage localities to work together on transportation projects. P3 Revisions (HB1886): Makes changes to the state’s public-private partnership (P3) program in response to the controversial U.S. 460 project, in which the state lost $300 million on a road that was never built. The new law adds state lawmakers to a steering committee that decides whether a P3 project can move forward. It also requires private entities to disclose risk that is being transferred to Virginia and requires the transportation secretary to sign off on the project. Ethics changes (HB2070/SB1424): Tightens gift limits for General Assembly members. In the wake of the conviction of former Gov. Bob McDonnell, the Virginia legislature put an aggregate $100 annual limit on gifts from lobbyists or those seeking to do business with the state. The legislation allows for the payment of travel to events of major national groups and exempts “widely attended events” from the gift limits. Additional incentive money (part of HB1400): Provides McAuliffe with the additional $27 million he sought for his “deal-closing” fund, which is used to help persuade businesses to invest in Virginia. The program’s name was changed from the Governor’s Development Opportunity Fund to the Commonwealth’s Opportunity Fund. Dominion regulations (SB1349): Removes Virginia’s ability to adjust Dominion Virginia Power’s base electricity rates for five years. This was one of the more contentious pieces of legislation and was signed by McAuliffe in February. Dominion says the legislation is necessary as the company likely faces stricter emissions regulations from the U.S. Environmental Protection Agency and could be forced to close some of its coal plants. The company says the legislation would help stabilize rates, while opponents say the state should be able to continue to regulate rates to protect consumers. Academic military credits (SB1335/HB2354): Instructs Virginia’s community college system to create a policy to provide academic credit for military training courses or programs related to the student’s degree requirements and that are recognized for academic credit by a higher education association. Crowdfunding (HB1360/SB763): Creates an avenue for Virginia businesses to raise money through crowdfunding in exchange for equity with Virginia-only investors. The law limits the total amount raised to $2 million annually for each venture and to no more than $10,000 received from an unaccredited investor. The U.S. Securities and Exchange Commission is currently writing federal regulations to allow equity crowdfunding. Virginia Board of Workforce Development (HB1986/SB1372): Makes several changes to the Virginia Board of Workforce Development designed to improve and measure effectiveness and accountability of publicly funded workforce development initiatives and career and technical education. It also requires the board to provide advice to the governor on ways to create a business-driven workforce system that increases attainment of workforce credentials and jobs. Small business procurement (SB885/HB1901): Helps small businesses compete for state-government contracts. The law changes Virginia’s definition of a “small business” to match that of the federal government, which varies by industry. Virginia’s current definition is 250 or fewer employees or annual gross receipts of less than $10 million during the past three years. The bill, however, needs to be reenacted by the 2016 legislature to take effect. Until then, it instructs the secretary of commerce and trade to convene a working group and recommend findings to the governor. Home day-care licensing (HB1570/SB1168): Requires state licensing for in-home daycare providers who care for five or more children. (The current requirement is for six or more children.) It also requires unlicensed providers to tell parents in writing that they are unlicensed and direct parents to the state social services website that provides information about licensing and regulatory requirements. The legislation was drafted in response to the death of Joseph Matthew Allen, a 1-year-old who died from injuries related to a fire at an unlicensed day-care operation in Chesterfield County.